Oadeem Wifi Smart Plug, No Hub Required Smart Socket. 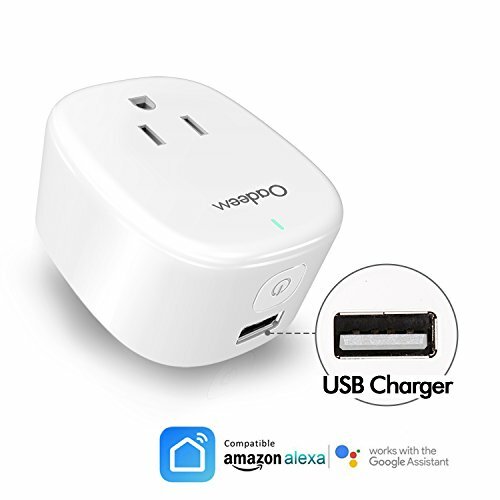 WORKS WITH ALEXA - This Smart plug works with Alexa devices. WORKS WITH APP - You can also control this Smart Homekit Switch by a cell phone, tablet. SCHEDULE AND TIMER FUNTION - Runing the house on your schedule. REMOTE CONTROL - Remote Switch Control From Everywhere. ENERGY SAVING - The Easiest Way to Cut Down Your Electricity Bill. Turn On/Off connected devices like lamps, thermostats, coffee makers, TVs, and other electronics wherever you are at any time anywhere! Set start charging your phone at 24:00, stop charging at 02:00. Over voltage protection for the circuit and your mobile phone. You can directly connet and charge all the devices which can use USB cable without pluging one more adapter. Make sure the computer or TV is turned off when they should be doing homework, or use a countdown feature to have any lamps shut off right before bedtime. Help make sure your kids are well-rested and ready for the next day. Power your festival holiday decorations in the smart way. No confusing central hubs to set up here. The Smart Plug simply connects to your home network. Just enter your Wi-Fi password and you're good to go. By setting up the timers, automatically turn off the appliances when they are not in use to help you save more money on your electricity bill.